Tonight we saw the United States grind out a tough victory versus Panama. It was a rematch with a team that had defeated USA in the group stage of this CONCACAF Gold Cup. As sad as this sounds, it feels good to know that there is a consistent expectation for USA soccer to win the CONCACAF and they are criticized for not producing results. As a soccer fan, I drool at the thought of a USA - Mexico match-up this Saturday. Tonight we saw many missed chances and plays stalling out over and over. Coach Bradley brought in Freddy Adu around the 67th minute, which shocked me. I had long given up on the once deemed "chosen one" for USA soccer. Freddy came in with great energy, only to have a couple of silly turnovers where it seemed like he was trying too hard to make a impact instead of letting the game come to him. This was the Freddy Adu US fans have become accustomed to. It has been 8 years since Freddy burst on the scene, yet we tend to forget he is still only 22 years old. For most of us, we still see him as an overrated asset asking for more playing time and then leaving for overseas before most thought he was ready. Freddy failed to make the World Cup squad and fell off the radar, but this USA team lacks creativity and needs help up front. Clearly society needs to stop trying to crown young men before they truly achieve greatness. We help create monsters like Lebron James, who feel that they are entitled to championships, and forget how much sacrifice and pain one needs to endure to even have a chance at a championship. Players like Barkley, Ewing, Stockton, and Dan Marino are just some examples of great players who never achieved the ultimate success. Freddy Adu still has the ability to bring excitement to the public when he was trending on twitter for just stepping onto the field. 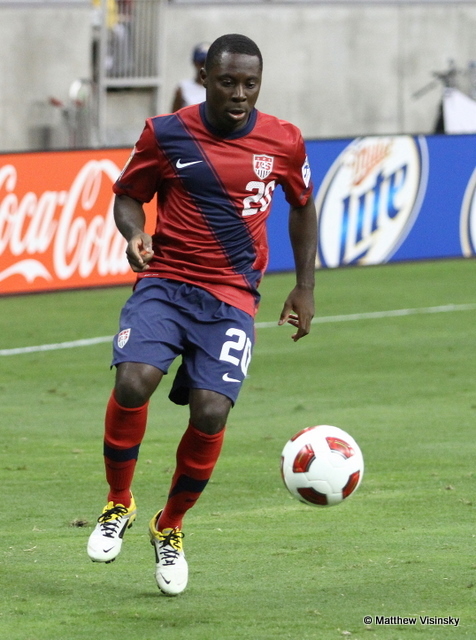 Freddy Adu was expected to be the face of American soccer. That caused him to become cocky and self-absorbed. Seems these days the bigger the ego, the bigger the mouth. It took a huge fall from grace and the removal from the national team before things changed for Adu. Freddy learned to keep his head down and mouth shut and has put in the work to gain the trust of his coach and teammates. His teammates seemed as excited as Adu after the game by Freddy’s performance. We tend to forget how talented this young man is and how badly USA soccer needs him. Failure either destroys a man or builds character and maybe this is a sign for a positive future for Freddy Adu. I hope Lebron was watching, because he could learn a thing or two from Freddy Adu, starting with shutting his mouth. We will be watching this Saturday and let's hope Coach Bradley has the trust to put the game in Freddy Adu’s feet.